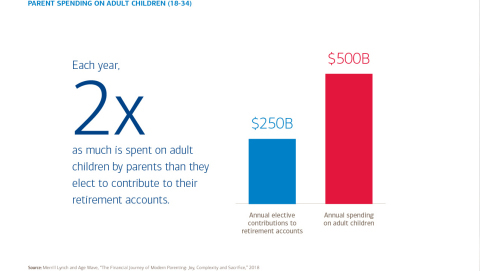 NEW YORK--(BUSINESS WIRE)--Parents in the U.S. now spend $500 billion annually on their 18- to 34-year-old adult children – twice the amount they contribute each year to their retirement accounts ($250 billion)1, according to a new Merrill Lynch study conducted in partnership with Age Wave. The study also found that nearly two-thirds of parents report having sacrificed their own financial security for the sake of their children. Even with the financial challenges and sacrifices, over 90 percent of parents say that parenting is the most rewarding aspect of their lives.